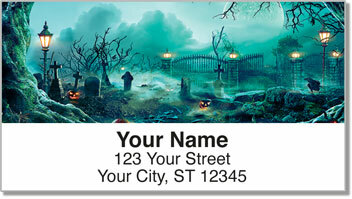 Every night is fright night with freaky and unique return address labels from CheckAdvantage! Hellish headstones, vampire bats and zombies are everywhere you turn on this colorfully creepy design. 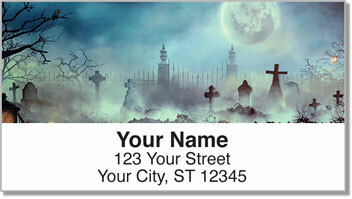 These labels are perfect for sending out Halloween party invites to friends and family. 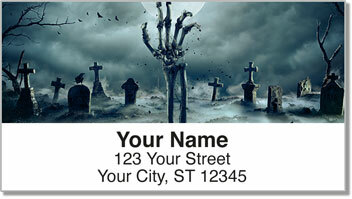 Halloween Graveyard Address Labels are so convenient - it's almost scary! You can use them all year long to save time preparing outgoing mail. The little time-savers have a self-adhesive backing, which means no more tricky licking - just peel and stick! 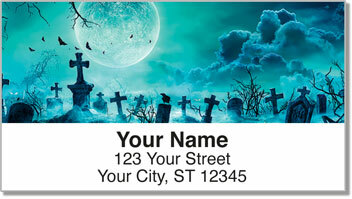 Get your own Halloween Graveyard Address Labels today! This seasonal design can also be ordered as a set of matching personal checks.